Welcome to our smoke-free hotel in Kimball, TN. We are located in the Sequatchie Valley just 20 miles from Chattanooga. Kimball is a wonderful town where you'll find friendly faces, beautiful scenery and a relaxed pace of life. 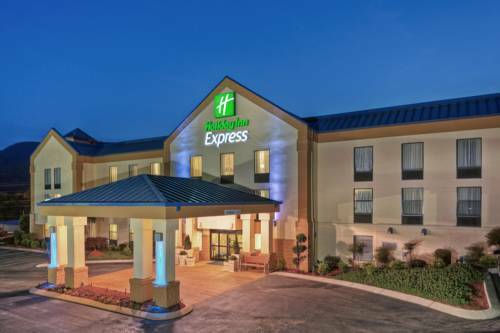 Staying at the Holiday Inn Express & Suites - Kimball puts you within reach of companies like Yamaha, CSX Railroad and Tennessee Valley Authority. Our Kimball hotel is also a great place to host your own meetings since we have a 423-square-feet room, as well as a computer, printer and 24-hour fax and copy services. If you're in search of fun, you'll have plenty of activities to choose from. Attractions near Chattanooga include Lookout Mountain, the Chattanooga Choo Choo, a fantastic aquarium and Ruby Falls, which has a magnificent cave and underground waterfall. Staying closer to Kimball means you can enjoy a little Southern history with Southern humor at the Buttonwillow Civil War Dinner Theater located in Whitwell. You can also check out the Adventure Offroad Park, Nickajack Lake and Russell Cave National Monument. If you're here at the end of April, stop by the National Cornbread Festival in South Pittsburg and indulge in a southern favorite. No matter what brings you to the area we are here to make your stay as comfortable and convenient as possible. We're sure you'll enjoy our top amenities, including an outdoor pool, a 24-hour Fitness Center and our complimentary Express Start breakfast bar. Call and book today. The Highest Rated Aquarium in America. Fantastic View, See 7 States. Ketner s Mill Country Arts Fair is two days packed with shopping, great southern-style foods, entertainment and activities for the whole family. The Chattanooga Area is filled with fun activites to take part in. Most are centrally located near the downtown area. From penguins at the Tennessee Aquarium to the Fat Mans squeeze atop Lookout Mtn, there are tons of things to do around Chattanooga.